If you’ve been reading this you’ve seen that I’m keeping track of weight gains and losses on the bike. With all the extra parts for protection and lugging, I would like to net out at a zero weight gain to the bike by replacing parts with lighter versions (e.g., exhaust pipe) and just tossing unneeded parts, like passenger pegs. The big things I could weigh individually, but the little stuff just got thrown into a bag to weigh later, like today. 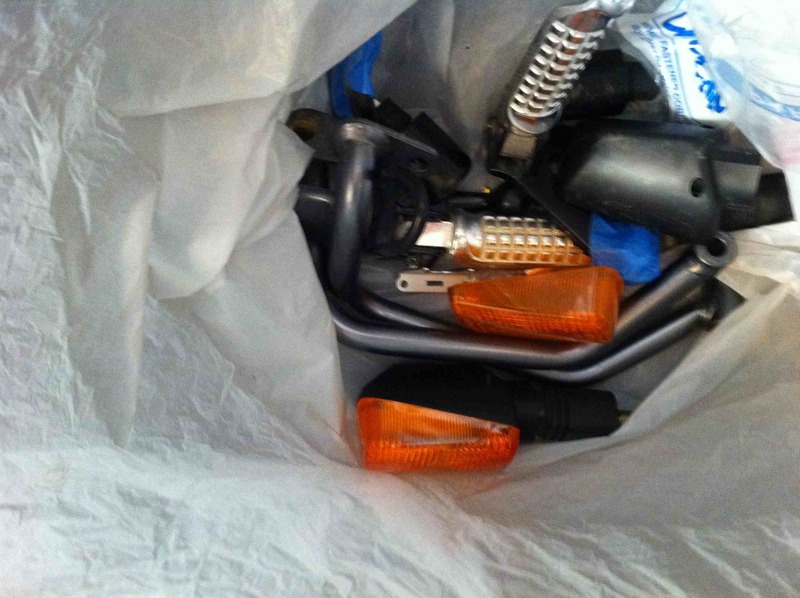 So here’s the bag ‘o junk – old turn signals, bar-end weights, passenger pegs, upper chain roller, piece off the clutch lever, etc. – and the weight savings, 5 pounds. 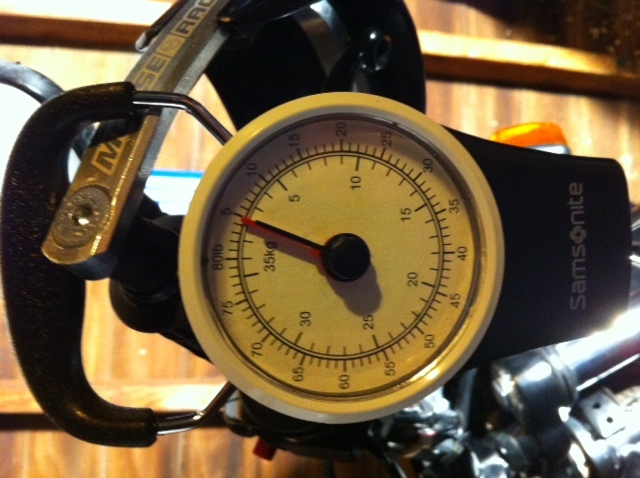 As of the February 23 post the bike had gained 1 pound. Not bad considering the tail rack, surf racks, skid plate, luggage rack, etc. But with this savings we were at a 4 pound loss, but. The DBz Flat Top Duffle tail bag came in today; that’s another 2 pounds. (The DBz stuff is really light.) And I finally weighed the magnetic (heavy) tank bag I already had (and had never used because my Ducatis have either plastic or aluminum tanks); 5 pounds! So the 4 pound loss has turned into a 3 pound gain, and there’s not much more I can do without spending a lot of money, as in hundreds per pound. Better to lose some weight myself!